Would love to hear from anyone who used Tinsel & Tine screening pass code to see the film. What did you think of it? Compared to Little Miss Sunshine, and let's face it, most movie-goers are going to make a comparison - Ruby Sparks has a less effervescent, off-beat charm; but it definitely possesses a quirky charm of its own. Due mainly to the endearingly pasty, idiosyncratic chemistry of the stars and real life lovers - Zoe Kazan and Paul Dano. The film explores what we look for in relationships; and it's this intention that allows us to buy into the impossible, in such a way that it feels completely possible. Tinsel & Tine is moving up in the world of movie blogging! I've been given a code to offer screening passes to my readers. (See below) This is super exciting to me and I really hope somebody takes advantage of it! The passes are for the preview screening of Ruby Sparks (click for trailer) it's the second film (6 years later) by the directors of Little Miss Sunshine - Jonathan Dayton and Valerie Faris. It's written by and stars Zoe Kazan, daughter of screenwriters Nicholas Kazan and Robin Swicord. 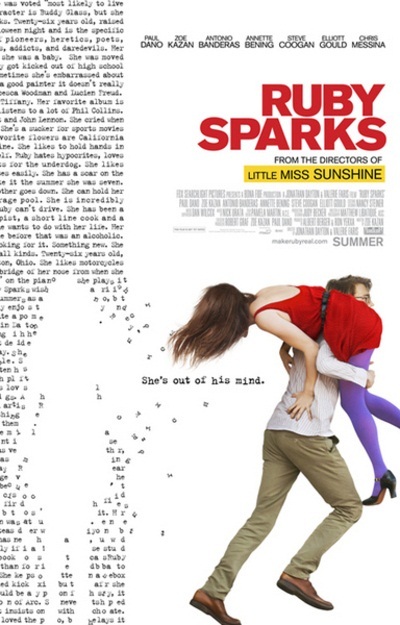 In RUBY SPARKS, Calvin (Paul Dano) is a young novelist who achieved phenomenal success early in his career but is now struggling with his writing -- as well as his romantic life. Finally, he makes a breakthrough and creates a character named Ruby who inspires him. When Calvin finds Ruby (Zoe Kazan), in the flesh, sitting on his couch about a week later, he is completely flabbergasted that his words have turned into a living, breathing person. There's even a food in film aspect to the movie - of all the many attributes Calvin writes into Ruby, making an Out-Of-This-World Meatloaf is one of the highlights. Here's one of my favorite meatloaf Simply Recipes. It's very basic, but very good! Go to www.gofobo.com/RSVP and enter the following code: TINSEL0B3S. Please remember seating is first come, first serve, be sure to show up early!